These Steel Half Gauntlets eliminate the weakness inherent with jointed armor, instead,these feature solid steel construction that helps to keep your hands safe in combat. 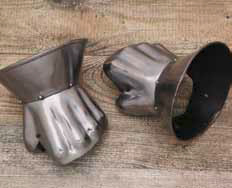 These gauntlets are made of 16 gauge mild steel and have a distinctive construction that combines a round cuff about the wrist with a shaped knuckle and thumb guard. While inflexible and rigid, the guard also performs very well as armor. Offered in one size, coming complete with a leather strap, a brushed exterior finish, and are bare steel on the interior. This page was last modified on 4 May 2014, at 17:27.